Lt. General Jamil Hassan, Air Force Intelligence, and Maj. General Ali Mamlouk, National Security Bureau. 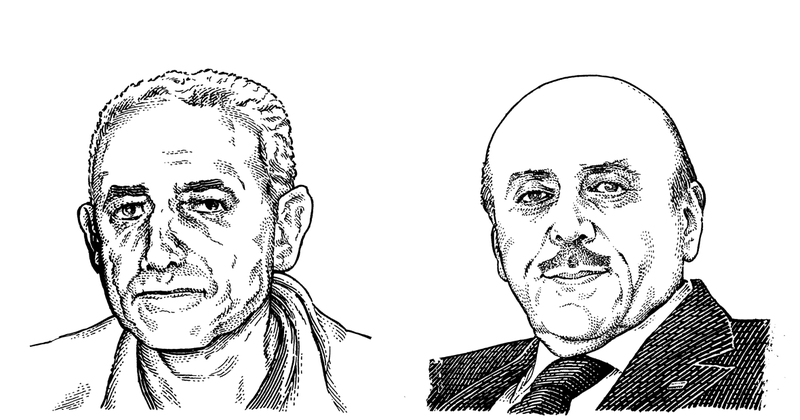 In issue 16 of Syria Notes, we look at the structure, leadership, and criminal actions of the Syrian secret police, the Mukhabarat. We have two articles looking at how military and political issues in Lebanon impact Syrian refugees. 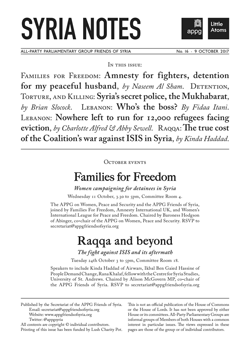 And we have two articles connected with events this month in Parliament: One from Naseem Al Sham of Families For Freedom, who will be speaking on Wednesday 11th October at a joint event with the APPG for Women, Peace and Security; And one from Kinda Haddad of the Airwars monitoring organisation, who will be speaking at our Raqqa and Beyond event on Tuesday 24th October. Printing of this issue of Syria Notes has been funded by Lush Charity Pot. Past issues of Syria Notes are archived here. Wednesday 11 October, 3.30 to 5pm. The APPG on Women, Peace and Security and the APPG Friends of Syria, joined by Families For Freedom, Amnesty International UK, and Women’s International League for Peace and Freedom. Chaired by Baroness Hodgson of Abinger, co-chair of the APPG on Women, Peace and Security. Tuesday 24th October 3 to 5pm. Speakers to include Kinda Haddad of Airwars, Ikbal Ben Gaied Hassine of People Demand Change, Rana Khalaf, fellow with the Centre for Syria Studies, University of St. Andrews.